yep, I've had to get the whole f.. module. Got one at rockaouto and - sure enough - was lucky to get substandard part (I'm in the process of disputing the order). Do not buy Spectra Premium (cheap but you get what you've paid for) or Delphi (ra either repacked wrong part or delphi just sells Spectra at 40$ premium, definitely not what pictured at online store). I've installed it in (had no time to futz around but I should have just return it, wish I figured it out sooner). The outlet did not line up with the original outlet (the original fuel line could not be repositioned to fit) and the fuel line supplied with the module was next to impossible to fit in, definitely not designed for the vehicle. All this after cutting tabs on the bottom of the tank (and I thought I was home at this point, yeah right). It works but the module looks disposable (can't see replacing just the pump if it failed), I broke the original fuel line (tried to shorten it to fit but getting the end back into the line is not an easy task, not sure what they use at factory besides heating the hose, it would pull out too easily). Plus the Spectra module (I just don't think it's Delphi, despite the box it came in, it even had the other part number embossed on the top) looks disposable and does not have the 2nd external fuel strainer. Do not buy (unless you're really cheap and like to make tough job an awful one). All this because you can't get original module/matching pump any more. Thanks Ford for flip flopping. You cannot shorten the line under the cover if that's where you went, the line is specifically molded to only use the length supplied there, the corrugations prevent any shortening with a decent chance of sealing. Once the sealing end was cut off you were history. The line has to hold full pressure and why made like that, it cannot be altered. (actually, it can, but another story). The outside line is simply pressed in fittings but using a special tool to do so. Tool about $100. Uh, most or at least many of those pumps, indeed other 'makers' as well, are Walbro pumps, others remark them as theirs too. Walbro is stamped on the side of pump. A good brand and commonly used by the OEM. I have one of the new type Spectra pumps in my old module and works fine but most will not go where I had to to make it work, and how I know how many little things they changed up there. I figured out most of the brands were same identical pump by simply looking close at the detail pics, the Delphi and Spectra are the same. Or, upcharge simply due to the Delphi name. Mine was $38. It appears to me much of the changing was to accommodate newer style smaller pump bodies as the design matures to get even smaller and cheaper, where the industry is going. I bet other car brands have had to change up modules to fit the new pumps too. Industry is moving away from like aluminum hard coated end castings and impellers because of ethanol damage to them, all plastic now and cheaper too. It never stops. Of course the million car pump recall figures in there too somewhere even though not Ford's fault there. Early ethanol maker refusal to properly filter the product brought that on. After they almost went under from damage claims they got their houses in order and problem is pretty much gone now. I'll say it again for any who come across this...................DO NOT USE THE LATE DESIGN 'PUMP ONLY' PART IN AN EARLY DESIGN MODULE, you'll regret it, they look close but will NOT work! And I'll just add to close my swap "adventure". According to RA staff, Delphi bought out Spectra and substituted their original model with Spectra's (while keeping the same price and making no remark of this change, nice try Delphi). DO NOT BUY ONE, especially at Dephi price level. You'll curse trying to fit fuel line into either of these, you'll curse more if you had to spend 40$ extra. I've got some price difference refunded (not all of it) but even then my weekend time is not free, not to mention the aggravation. Had I received the module mid week (no time to mount it immediately) I'd first arranged for return and went with better module (or just got one from junk yard and and saved a bundle). I got the vehicle ready just in time for next snow storm (and prepped for trip across States in 2 weeks) but I regret rushing it (and falling for Dephi's scam, yep, I see no other name for this renaming bs). See you on the road (for now I'm done with whole bunch of rebuilds that should keep my zx3 running into 200k). on my 2005,the fuel pump is more in the center of the car,not where it is in these pics <ref page-1 of this thread> for the earlier models. Adding a link here that has pics and discussion for those with a metal fuel tank. 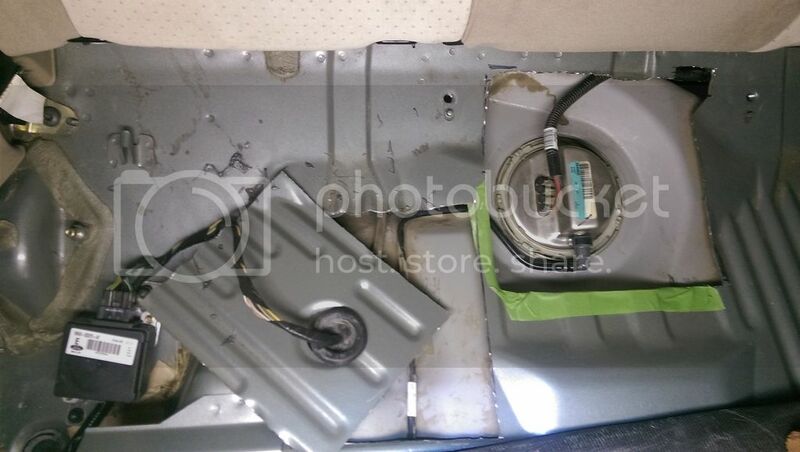 Location of fuel pump access panel is different than older cars/OP's car. Access panel cut-out on the left side (see pic below) was the standard, normal, older car location but was NOT needed because of the redesign of the tank. Only the center cutout is needed, and only if you have a metal fuel tank. Pic is from a 2004 PZEV Wagon; and will be the same on the Sedan and Hatchback. Not sure, but I believe this access panel location will be the same for others, 2003 to 2007. Performing this cutout is (1) highly dangerous, please work slow and careful (2) both smart & dumb -the fuel pump replacement is done professionally by dropping the tank instead (3) could be justified by concerns of damaging misc old fittings & hoses if dropping the tank; or other reasons/excuses. When I installed my Ford Racing Whipple supercharger upgrade in my GT500, access was not the problem, is was stuffing that Dual Pump back into the tank through the hole that looks like the Focus's size. I sure cut my hand up. There even was hoses from the other tank that had to be attached back once it was partially in. That was harder than reconnecting the modified EGR tube the kit came with and that was another real bear to install as it seemed to be 3/8" too long and there were compression type fittings that had to be connected that you really could not see when installing. I did love the 750 HP after it was done and it ran so much like stock till you made the mistake of getting into the power band area, then hold on. I know there are other people that have had much more powerful cars but my GT500 was so drive-able and the car did handle pretty well and it was not a single purpose drag strip vehicle. To bad that I do not think there will be another 2016+ GT500 with all of its improvements. This is not the best thread for asking this support. You will get better feedback in creating your own thread with a title more specific to your problem vs this How To. Are you getting any check engine codes? might need to drive it more. Could be that you forgot to hook something up? Fuel Filter? Coil pack? Either way, asking in a dedicated thread will get you better answers. I would like to do this on my car but use shears, snips, or a an air powered nibbler to cut it (no sparks) . What is the thickness of the metal ( in " gage " ) ? Last edited by rkpatt; 03-13-2016 at 08:40 AM.